Not unexpected, or at least shouldn't be, but after some constructive criticism from two of my proofreaders, I'm poking my head back into the very ending of DoW and reworking it a bit. One twist too many. :-) I had an alternate ending in mind originally, but went with option B. I'll go back and try on my original plan A, see if it fits better. It will, I think. I should have listened to the inner voice, as they say, since the novel does progress to a certain inevitable conclusion but I changed gears at the very end, always a risk. But that's how it works, and just shows how important it is to have some front-line readers to make sure you didn't get off course. Shouldn't take too long. In the meantime, I've been slowly putting together a chapter synopsis which, if you've never done one, requires a lot more work than it would seem. Condensing the entire novel into a 2 page summary, while maintaining some sense of dramatic flow, is critical since the synopsis is a primary marketing tool when sending a novel out to editors. Also got a nice "fan mail" from Jennifer Pelland with whom I share the issue. Doesn't happen often in this business, but when you get a "nice job" note from someone you don't know, it makes a writer's day. And that did. 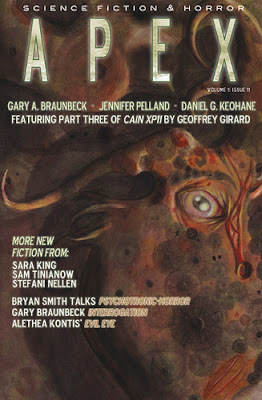 The New issue (#11) of Apex Science Fiction and Horror Digest is now available, featuring my story "Ray Gun." Thanks to everyone for another knockout issue! It's amazing the amount of work that goes into making a 128 page magazine, from the writers & artists to the editors and publisher. I hoped to go back into Plague of Darkness to work out a slight revision I worked out with the book's potential (and still undisclosed) publisher/editor, but I'd made some preliminary changes on my Palm Pilot (this is SUCH a cool tool... TOOL, not toy... every writer should have one of these, with MS Word To Go... so cool - I can work on my writing, in MS Word, in the Wal-mart check out line! How cool is that? How cool is that?)... what was I.. oh, yea, I synched the Palm onto my home pc and forgot to Flash Drive it, so it wasn't on my ThinkPad (a time traveler from 10 years in the past is reading this thinking, "Huh?"). So, after about 15 minutes of free-writing (actually I was mostly whining and venting in Times New Roman 12 point), I began to flesh out some actual plot points for the next novel - one I had no idea I was going to write. I thought the next book was going to be called Frost, with an entirely different plot, but my Muse decided I needed to write this one first. It's called, for now, Lost in the Woods. Don't try to assume what it's about. Lost in the Woods. I like it. Gets right to the point (except that, well, no one actually gets lost in the woods...). That's it. Have a meeting to attend. Just finished typing my final edits into the manuscript for Destroyer of Worlds. Man! I love how this thing ends, and I have to say Hank Cowles is the best baddie I've ever written, well, him and Nurse Charles. Felt GREAT last night in Barnes & Noble, while waiting for Amanda's dance class to end, to scribble the final edit on the print-out, and felt just as good a moment ago when I typed this last change into the manuscript. My final changes were done on November 2nd. Two days off my self-imposed deadline. 7 months total from the day I started the outline, and I really, really am happy with the final result. But... what I think doesn't count. Not yet. Book's not done. It's currently under the editorial microscope of three fine, able proofreaders: Mark Lowell, Fran Bellerive and Michelle Pendergrass. So far the comments coming in have been great (not as in, 'This is great!' though the response has been positive - trust me, if you're new to my world, this is not a common event.. lol.. but as in lots of very constructive suggestions). Life at home has been so busy Janet hasn't had a chance to pick it up yet, but she will. She may be my wife but she's just as ruthless as the rest. The perfect attribute for a proofreader. Anyway, just happy with myself at the moment. We have so few of these self-congratulatory moments. Felt like posting.